What you see below was my total crop of potatoes from the garden this year. I planted three rows of 15 plants each and this was it. I might have to set a better watering system next year. Dang heat. I knew I wanted to can potatoes again this year. I love the convenience of opening up a jar, draining it, and dumping the potatoes into a frying pan. Almost instant fried potatoes! 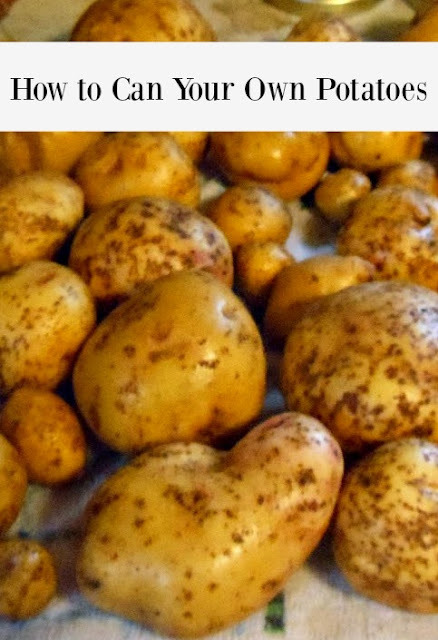 You don't need garden potatoes to do this, by the way. A bag of potatoes from the supermarket will work too. This is also a canning project that can be done any time of the year. 1. Wash the potatoes thoroughly. Set a pot of water to boiling. Get your pressure canner ready to go and set to boiling. Place quart-size jars into hot water or a warm oven to get them hot. Set a small pan of water to simmer for the lids. 2. Peel the potatoes if you would like. (I don't, but that is a personal preference.) Cut the potatoes into similar size pieces that you can get into the jar. I do roughly one-inch pieces of potatoes. Toss the lids into the simmering pot of water. **At this point you can boil the potatoes for 10 minutes if you would like before packing the potatoes into the jars. I follow the raw pack method and have perfectly good results. 3. Pack the potatoes into the hot jars tightly. (I didn't have enough potatoes for six quarts so I used a few store-bought potatoes.) Ladle boiling water over the packed potatoes. If desired, add a teaspoon of salt over the potatoes. 4. Use a spatula or a butter knife to get down the sides to release the air bubbles. Put lids and rings on the jars after wiping the jars to get rid of any residue. 5. Place jars in the pressure canner using a jar rack. I don't always use mine, but it is recommended. Place lid on top of the pressure canner and lock into place. Let the canner come up to pressure and follow your manufacturer's recommendations. I have an old pressure canner and just have a weight on top. 6. Process the potatoes at 10 pounds pressure for 40 minutes if using the quart jars or 35 minutes if using pint jars. Pressure may need to be adjusted according to altitude. When done, remove canner from heat and let the canner cool before opening the canner. Take the jars out and let cool. 7. After 12 hours, check the jars to see if they sealed. The jars may be cloudy, but don't let that freak you out. Label and date the jars. Eat later and enjoy! This is one of the simplest canning recipes I have done! Try it and let me know how it works for you!